MONGOLIA IN BRIEF Mongolia holds some of the worldâ&#x20AC;&#x2122;s greatest untamed lands. These wild, beautiful habitats boast an impressive variety of wildlife and are rich in verdant forest, towering cliffs, rugged mountains, endless grasslands and the Gobi Desert. You can choose a range of exotic trips from treks in the magnificent Altai Mountains, visiting nomadic people while riding horses or camels. Those who love wildlife, please join our bird watching trips or observing the only species of true wild horses, Takhi, in the wilderness. You will enjoy the world famous Naadam Festival with traditional endurance horse races, archery and wrestling tournaments and Eagle Hunting Festivals. Please join us to learn the rich history of the Mongol Empire and Chinggis Khaan, and other nomadic statehoods. We explore areas seldom visited by tourists such as remote parts of the Gobi Desert, Western and Northern Mongolia. Choose from comfortable road journeys to those adventure seeking tours each designed to show you the countryâ&#x20AC;&#x2122;s finest wildlife and culture. Our tours are intricately planned and include programmes of lectures with special guest speakers. We will take you to local art galleries and museums in the capital of Mongolia. 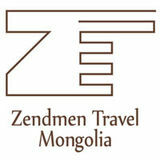 WHY CHOOSE ZENDMEN TRAVEL Environmentally friendly operation, respect for the local people and culture, preservation of wildlife are high on our agenda. Thus, we support environmental conservation and campaigns against child exploitation. Travelling with us means you are part of these initiatives and contribute to make a real difference. Most tours reach remote peripheral regions, where we bring economic benefits to rural communities. Also, we are one of the very first tour companies achieved Travelife Partner, sustainable tourism certification scheme by EU, and targeting Travelife Certificate in the short run. Each tour can be tailor-made with specific local festivals, adjusted travel routes or tour extensions. Tours are designed and checked with caferul consideration of safety. All these are possible with the help of our passionate and professional team who are both experienced and considerate in various aspects of tour arrangements such as boutique hotel, local family stay, healthy meal choices, comfortable transport, cultural and historic sightseeing, and all the pleasant surprises in Mongolia. NATURE The western region of Mongolia has some of the most spectacular landscapes as the towering Altai mountain range meets the Gobi desert. Such unique geography provides an isolated heaven to some of the world’s most exotic wildlife which includes the majestic snow leopards, Gobi bear, ibex, mountain goats and saiga antelope – the only mammal that survived through the last ice age. FESTIVALS Western Mongolia is also home to the Kazakh tribes who preserve their centuries-old cultures until present day. Well known for their eagle-hunting skills, the Kazakhs organise the annual Golden Eagle Festival every October where the nomadic herders present their prized eagles to compete in some exciting hunting games. It is one of the must-see festivals in the country. CULTURE In the culture front, both Khoomii singing (or throat singing) and bielgee dance are on the Representative List of the Intangible Culture Heritage of Humanity of UNESCO. Khoomii singing is believed to be originated from Western Mongolia. This unique melody mimics the roaring sound of the wind that blows between Mt Chandmani Khairkah and Mt Bumbat Khairkhan, as well as the whistling sound of the weedgrass in the adjacent Lake Khar Us caused by this wind. Another belief is when strong wind blows over the surface of the Gobi sand dunes, it emits the humming sound that is similar to the overtone singing. It is no wonder that Mongolia’s throat singing is a result of imitating nature’s sounds in combination of human’s vocal talents and evolution of folklore. ARCHAEOLOGY Archaeological discoveries make Western Mongolia worth every visit. Pre-historic cave paintings of Tsenker, petroglyph and burial mounds, all dating back 45,000 years, offer fantastic opportunity to learn and witness ancient beliefs and art. HOW ABOUT EXPLORING the riches of Mongolian untapped resources of mountain biking adventure with Zendmen travelâ&#x20AC;&#x2122;s signature mountain bike Trail riding tours? Whether beginners or experienced riders, relaxed, recreational weekend rides or serious self-challenges our tailor made tours with XC feel will raise your spirit over the clouds. These double and single track rides cover beautiful all natural terrains of mountain passes, woods, rolling hills, river valleys, steppes or even the mighty Gobi desert. From overnight two days rides to five days challenge tours will take you out of the city stress, give you feeling of selfesteem and connection with the nature same time keeping your comfort with quality tent camp, shower and facility. Healthy snacks and lunch break provided during the ride, and freshly cooked dinner awaits after the ride along with nice cold beer, fruit juice and wine. Nights are made unforgettable with campfire chill-out before going to your cozy mummy bag. Mornings are started with energizing breakfast, tea and coffee for another adventure ride in spectacular landscapes that will take your breath away. Experienced rider guides advice for safety and guarantee your enjoyment while technical support with off-road vehicle keep your bike maintenance and carry all necessities. You can bring your own bike or rent quality brand bikes from us. Experience the great escape to the virgin nature, witness the true nomadic world, enjoy the time with your friends and challenge yourself on two wheels. WHAT IS OUR DAY OF A COMFORTABLE TOUR LIKE? Our tours are designed to travel with as much as comfort possible for the route with limited driving hours. There are up to three people in 4x4 drive jeeps. Travelling in Mongolia often involves long distance driving. We usually set off around 9 am after having leisurely breakfast and travel until the next lunch stop at 1pm with en-route intermissions at planned visit sites. For a group trek (up to 12 people), tour crew with a kitchen van travel ahead to make sure to set up camp site and prepare meals before travellers arrive. Camping toilets with a doomed tent and seats are set up for ladies and gentlemen separately. In remote mountain regions, a bowl of warm water for washing and hot drinks are provided early in the morning. If the dayâ&#x20AC;&#x2122;s driving takes longer or little beyond the average distance, we bring lunch boxes for enroute stops in beautiful scenery. Dinner is an important meal of the day in Mongolia, where we get together briefly for 15-20 minutes afterwards to discuss the dayâ&#x20AC;&#x2122;s highlights and things we could possibly consider to make the journey enjoyable experiences for a every single member of the tour family. Ger camps provide comfortable single or double bed as per guest requested. We will sleep on a comfortable mattress in a duvet with bed lining with an extra woollen blanket on top. Unless you requested a single supplement, there will be double in a ger. We use mainly en-suite gers which is equipped with a private bathroom. There will also be a traditional fire stove in the ger which is used to warm the ger up in the evening and early in the morning. If it is too cold, a ger attendant will light a fire in the middle of the night if you request before going to bed. At night, Mongolia usually offers a pitch dark sky with thousands of stars. If you are a star gazer, this is the best time to spend your time outside. Mornings can get chilly even in summer, as there is relatively high temperature fluctuation between day and night. Mongolia is one of the remotest birding destinations in the world lying at the heart of vast Asian continent and about as far from the world’s oceans as you can get. If you have a vision of Chinggis Khaan riding across a landscape of vast windswept deserts and steppes with no end to the horizon then you won’t be disappointed but you may be surprised to see vast snow-covered mountain ranges and huge wetlands as well because this is a country of great contrasts. Join us for a journey through the Gobi Desert’s ancient mountains, green glens and sand dunes, against a backdrop of blue sky by day and a starfilled sky by night. Marco Polo paid a visit to the Gobi, and more recently Roy Chapman Andrews discovered the first-known dinosaur’s egg-nest at Flaming Cliffs. Explore a land of yak herding nomads, Buddhist temples, and dramatic landscapes in stunning countryside of Mongolia. Enjoy watching yak race, Yak polo and how they attend in the beuty contest of yaks. Highlights of the trip include, among other, annual Yak Festival and a picturesque Ulaan Tsutgalan waterfall. Flanked by the scenicKhangai Mountains, Zavkhan offers some of the most varied landscapes in Mongolia. You will experience vast desert land, serene lakes and incredible sand dunes all within close proximity of each other. The sharp contrast in terrain makes travelling in this area unforgettable. THINGS TO DO: You will go to the edge of Hustai National Park, one of the three places in Mongolia where you can see wild horses, Takhi or Przewalski horses. Takhi horses were extinct by 1960’s in Mongolia and have been reintroduced in Hustai National park since 1993. Visitors can go hiking in the national park to observe the Takhi horses, elks, roe deer and marmots. Most comprehensive field guide to birds of Mongolia covering 500 species that occur in Mongolia, including all residents breeder to vagrants. The book provides all description texts required to identify species at plumage, posture including on ground and flight, by voice. Totally 150 colour plates contain over 3500 superb illustrations indicating every species in all the plumage including sexing, aging, geographical races and subspecies, flight and on ground, specific posture of front and back. Map is created along modern field guide; it can be much detailed due to subdivision for subspecies. Thus ‘Birds of Mongolia field guide’ is must-have primary-recourse for birdwatchers, eco-tourists, and wildlife enthusiasts. NATURE Mongolia is famed for the Gobi Desert and its excellent paleontological findings worldwide. Gobi refers an arid land with sparse vegetation in Mongolian while desert is synonym to barren land without life. One third of Mongolia’s vast territory may be classed as gobi, of which some stretches to north western Mongolia. Southern Mongolia is mostly dominated by arid gobi and steppes. WILDLIFE Despite its harsh and alien outlook, the Gobi supports abundant wildlife, nutrient vegetation and home to exotic animals. Two humped Bactrian camel could best represent the area and majority of this fury giant domestic animal inhibit in the gobi region. CUISINE & CULTURE Silk road, Tea road would not be possible without legendary camel caravans. 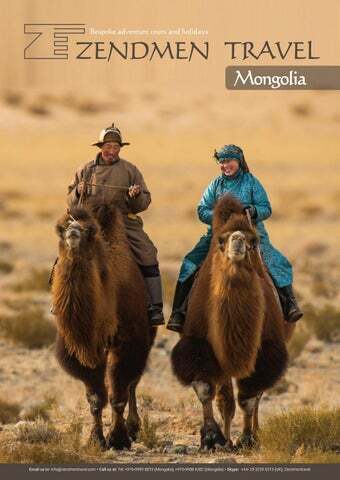 At present, Mongolian provinces with camels celebrate annual Camel festival including camel race, camel polo and camel caravanning tournaments. Camel drink is well known for its medicinal quality. Oscar nominee documentary, “Tear of the Whipping camel” tells the customs, ritual and the way of life in the Gobi without exaggeration. ART Vastness of Mongolia’s steppe may be associated with the origin of its long song and horse headed fiddle. Mongolia’s traditional wedding ceremony begins with series of long songs and traditional praises. Recent success of Mongolians at BBC Cardiff Singer of the World, biannual opera singers’ contest in the UK, could possibly be rooted Mongolia’s traditional singing tradition and throat singing. In 2017, two Mongolian singers were shortlisted the final 20 of whom Ariunbaatar Ganbaatar became a joint winner of the Song Prize via singing The Steppes of Mongolia by Sharav. ANNUAL NAADAM FESTIVAL Well, Naadam literally means playing game. Each administrative region in Mongolia celebrates Naadam Festival after or before the State Naadam Festival (11-13 July). Upon Mongoliaâ&#x20AC;&#x2122;s revival of independence in 1921, Naadam Festival became the celebration of independence. There are 512-1024 wrestlers in the wrestling tournament while 6 different age categories of horse races take place. Archery tournaments consist of three styles including Buryad, Urianhai and Halh named after by three ethnic groups respectively. Each archery tournament has differing styles of shooting, distances and accessories. Also there is knuckle bone shooting tournament takes place in which competitors shoot animal knuckle bone to hit a target as seated. Naadam Festival commences with a colourful opening ceremony with staged performances and parade. The opening ceremony of the Naadam Festival is the grandeur in its sheer size and could be most attractive for international visitors. If you are unwilling to join a large crowds, district and provincial Naadams offer very personal and intimate experiences of meeting local wrestlers, jokey children and archery athletes. Enjoy your Naadam in Mongolia.